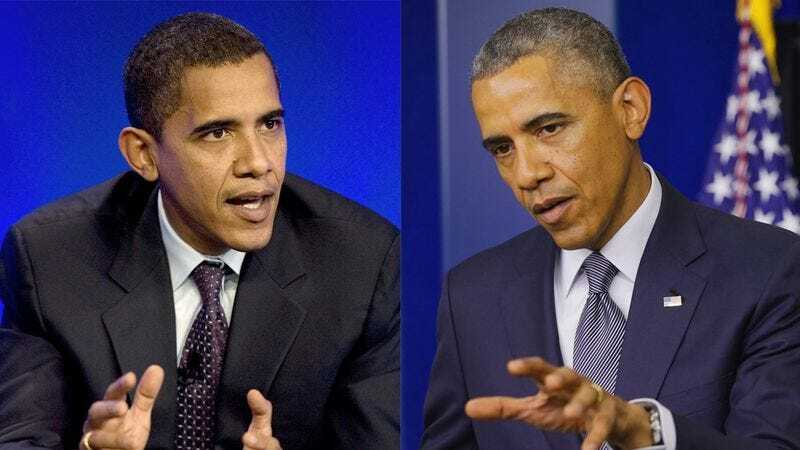 Candidate Obama Vs. President Obama: Who Would Survive? By now, it’s clear the Barack Obama of today and the Barack Obama we met on the campaign trail back in 2008 are two very different men. So let’s go ahead and ask the question: If we pit “Candidate Obama” and “President Obama” against one another, who wins in a no-holds-barred brawl to the death? One-on-one, untimed, no mercy rule. Before we get into the all-out carnage between the idealistic firebrand Candidate Obama and the grizzled, cynical (and some would say disappointing) President Obama, let’s set some ground rules. First, no weapons allowed—that goes for everything from swords to guns to presidentially authorized military strikes. Second, neutral terrain—somewhere both Obamas know well. Downtown Chicago will do. Candidate Obama comes out strong with a furious barrage of haymakers, rhetoric about curbing emissions while protecting coal producers, and deft roundhouse kicks. The agility, impassioned idealism, and sheer physical prowess of the 46-year-old Obama are on spectacular display as he flies at his veteran double, swinging wildly and denouncing the commander in chief for betraying principles he once claimed to uphold. But President Obama is ready. Remember, he’s got nearly six years of Washington experience under his belt—that’s six more years to hone his hand-to-hand combat skills. He may not be able to outmaneuver his younger self, but his more measured, reserved (and some would say disappointing) outlook would let him use the Candidate’s fury against him. Plus, assuming they come from the same timeline, President Obama’s got all of Candidate Obama’s memories. This could well prove to be the decisive factor. Sure, the energetic tyro Candidate Obama has the uncorrupted fire of youth on his side, but good luck landing a critical hit when your adversary knows all your moves. Let’s say he tries to catch the President off-guard and take his feet out from under him—President Obama would know that it’s coming and spin the attack into a devastating reversal. Suddenly, 2008 Obama is lying on the ground, and that’s when it turns ugly. His pleas for mercy fall on deaf ears as 2014 Obama, hardened by years of bitter Capitol Hill conflict, finishes Candidate Obama off, understanding that victory sometimes requires sacrificing something close to you—even killing someone who is you. Who knows, though? It could also go the other way, as an exhausted President Obama, beset by scandal and worn down by his several epic battles with John Boehner, gets outright overwhelmed by Candidate Obama’s zeal. One thing is certain: It would be a showdown for the ages, the ultimate test of cagey wiles versus raw strength. And woe to anyone caught in the fray as the two Obamas go at each other’s throats.